Well, we did not get up into a room until 8:00 pm and hit a few bumps once here. As expected, Maylee is in a great deal of pain. Both her back, where the incision is, and headaches from the spinal fluid kept both of us up most of the night. She also had some sort of reaction to the foam that was holding her chin and forehead during surgery. Almost as soon as we entered her room, hives began to form all over. Thankfully, Benedryl did the trick and no breathing problems ever showed up. They had just cleaned the room with a strong smelling cleaner and I really think that is what caused the hives. As for the foam, I'm not sure. Hope to find out today exactly what it is made of so that we can avoid it in the future. 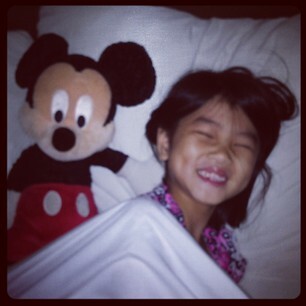 Here is a sweet picture from the night before surgery with her beloved Mickey. The one thing that makes surgery just a little bit better is that each child takes a trip through the Bunny Tunnel before surgery in order to pick out a special toy/treat. Maylee picked out this journal. I'm sure her selection has something to do with the color PINK, which is her favorite! As for the surgery, well...it went as well as could be expected. The surgeon was able to do a good bit of detethering on the right side, which is great because that is the worse leg/foot. She worked some on the left side as well. But, it was so difficult to differentiate the fibers and nerves, that she did not want to mess around too much and destroy nerves. As for nerves, there was one nerve on the left side that was clipped. This will probably cause some loss of sensation on front of that leg. But, only time will tell. 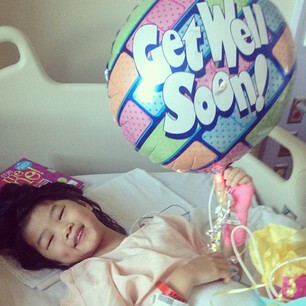 One of the biggest struggles is that Maylee has to lie flat for the 48 hours after surgery. She can't even have a pillow, which is really bothering her. But, all in all, I say she has fared pretty well considering all that she has been through! Thank you for the prayers! They have been felt! 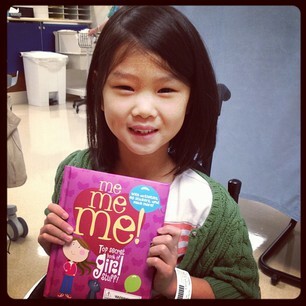 One last picture of Miss Maylee this morning, STILL SMILING! !